Are you and your soulmate ready for the big “I do”? 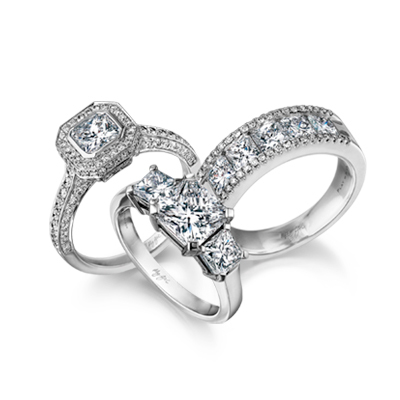 Finding the perfect engagement ring is one of the most important and exciting steps to starting your journey together. But with so many things to consider when it comes to choosing an engagement ring, you may feel you need a bit of guidance. You might be wondering how to choose a diamond, or how to find your ring size. Perhaps you need assistance on different diamond cuts, engagement ring styles, types of ring settings, the best metal for rings, or how to choose a wedding ring that will complement the engagement ring perfectly. If you need insights from our experts in choosing an engagement ring with confidence, you’ve come to the right place. Our engagement ring buying guide will take you through each step to finding the perfect ring that both you and your significant other will adore. Having a sterling reputation as industry pioneers, Shimansky not only has great tips for buying an engagement ring but the expertise, skills and resources to create something extremely exclusive and distinctively unique for your special occasion. Some of the big questions many engagement ring shoppers ask are: “How much are engagement rings?” or “How much should you spend on a wedding ring?” You may have heard about the commonly mentioned rule of thumb that sets the average budget for an engagement ring at two months’ salary. Contrary to this popular guideline, we believe that when it comes to engagement ring budgeting, nothing is set in stone. Every couple is different, so instead of following strict rules or guidelines on your engagement ring budget, we recommend taking a more personal approach. Set a budget that you are comfortable with, whether it’s more or less than two months’ salary. Finding the perfect engagement ring starts with choosing the right diamond for you. So, once you’ve set your budget, it’s time to explore the diamond types that are within your price range. Knowing how to buy a diamond is based on the 4Cs – Colour, Clarity, Cut and Carat Weight. The colour evaluation of a diamond, measured according to GIA's D-to-Z colour grading, is based on the absence of colour. The letter D – the highest grade on the scale – represents colourless. A diamond’s clarity is graded from F (Flawless) – the rarest of the rare – to I (Included). Carat is the standard unit of weight used for diamonds. Since large diamonds are rare, they are more valuable than smaller diamonds of the same colour and clarity. A diamond’s cut is one of the most important grading aspects as this is where technical expertise enters the picture. The cutting process reveals the diamond’s exquisite hidden wonder beneath its rough exterior. Our skilled craftsmen have mastered the supreme artistry of unleashing a diamond’s light and revealing the magic that lies within. Whether you prefer a mesmerising pear-shaped diamond cut or the classic My Girl Shimansky signature diamond cut, you are guaranteed to find a diamond with design excellence when choosing a Shimansky creation. Which diamond will you fall in love with? With our wide variety of exceptional diamond shapes and cuts, you are bound to find a diamond that will suit your unique style and personality. One of the most important aspects of the anatomy of a diamond ring is its setting. The setting is the way in which the diamond is secured in a gold or platinum mount. There are many types of ring settings that, according to personal preference work better with certain diamond shapes than others. Deciding on a setting for an engagement ring is just as important as selecting a diamond, as the setting will not only add to the allure of the ring, bringing the unique diamond and design of the ring together but will secure the diamond in place. When choosing a ring setting it’s a good idea to keep your lifestyle in mind. The idea is to choose a ring setting and ring shape that will seamlessly become a part of your life. If the bride-to-be has an active lifestyle or works with materials that can easily snag, the bezel or tube setting may be the perfect choice. Perhaps you want the diamond to take centre stage. Then consider the classic claw setting that reveals the entire profile of the diamond. Another highly sought-after engagement ring style is the halo diamond ring setting – a great choice for brides-to-be who want the appearance of a larger diamond. It does not matter which engagement – or wedding ring style you have in mind – at Shimansky you will find that exquisite and unique ring that will celebrate your love in style. What is the best metal for? Our engagement ring guide wouldn’t be complete without guidance on this important aspect. Gold and platinum are the two most sought-after metals for engagement and wedding rings. Choosing one over the other is mostly determined by personal preference. The most obvious distinguishing characteristic between gold and platinum is colour. Gold is naturally yellow and platinum is white. White gold is composed of gold, alloys and a rhodium plating, which gives it a white look similar to platinum, while rose gold is composed of gold and a copper alloy to get that beautiful pink colour. If durability is important to you, platinum is the preferred choice. Among the other engagement ring tips, another important factor to consider is to make sure the ring is sized perfectly from the moment you slip it onto her finger. If you would like to keep the proposal a secret and you don’t know her ring size you can turn to our secret guide to determine her ring size for some handy tips – like how to measure her ring size without her noticing. Our ring size guide will help you plan the perfect proposal without giving the surprise away so you can sweep her off her feet when you get down on one knee. Shimansky understands the importance of these special moments. That’s why every masterpiece in our range of classic, timeless and contemporary designs is crafted with attention to detail to celebrate the special moments in your life in style. We have the expertise and skill to guide you through this important occasion. Whether you are looking for the perfect diamond engagement ring or simply need advice on the engagement ring shopping- or design process, book an appointment at one of our stores today.